Premont ISD in South Texas has made drastic moves to improve its finances — including cutting high school sports. But critics fault the state's accountability and school finance systems, which they say punish districts that serve largely low-income populations. PREMONT — The hallways at this rural town’s only high school were deserted on a Tuesday afternoon in January, much to Enrique Ruiz’s delight. It meant everyone who had shown up for school that day was in class — a sight that Ruiz, the school’s principal, has learned not to take for granted. Getting students to school and keeping them there has become a matter of survival for the 570-student Premont Independent School District, where lagging attendance rates are hurting the district financially and academically. The district received notice in July that it would face closing because of its years of poor academic performance and shoddy finances. The South Texas district has made drastic moves to improve its finances — including cutting high school sports — and in December the Texas Education Agency granted it another year to reach certain benchmarks and avoid closing. But as Premont ISD struggles to make improvements, critics blame the state’s accountability and school finance systems, saying they unjustly punish districts that serve largely low-income populations and get meager per-student financing. Premont ISD is one of just two Texas districts facing possible closure this year — the other is North Forest ISD in northeast Houston. Premont ISD, which is located in Jim Wells County and has struggled with high teen birth and poverty rates, is in a primarily Hispanic town of 2,600 sandwiched between the relative hubs of Alice and Falfurrias on Highway 281. Only 32 percent of its ninth-graders passed state standardized tests in math in 2010. Since a mold infestation two years ago, it has operated without high school science labs. Premont’s troubles are nothing new. By failing to trim costs and staff in the wake of declining enrollment — the district’s student population has decreased about 25 percent since 2006 — it accumulated hundreds of thousands of dollars of debt. After the town passed a tax increase in November to help fill the district’s coffers, the TEA granted the district another year to meet a set of 11 conditions to avoid closure, including retiring a $400,000 line of credit, restoring the science labs and improving performance on state standardized tests and attendance rates, which had been below 90 percent. New hope for survival prompted Superintendent Ernest Singleton in January to do something drastic to trim costs: suspend athletics. The move captured national media attention. In January, in front of 4,000 other school leaders at an educators’ conference in Austin, Robert Scott, the state’s education commissioner, commended Singleton’s efforts to turn around the district. But the local response was even more valuable. In March, neighboring school districts announced they would help raise the $100,000 that Premont ISD needs for the labs. At least two corporations that do business in the area — Exxon Mobil and Jetta Operating Company — have contributed $20,000 each to the district, and Singleton said discussions with other potential donors are in the works. The bank that holds the $400,000 line of credit has agreed to give the district more time to repay the loan. Premont ISD’s future looks brighter now than it did in December. But Singleton said there is still much work to do to change the culture of poor academics and truancy. Through his home visits to students on days they missed school, he said, the district has been able to increase its average attendance rate to 92 percent. That is still below its goal of 96 percent, but it is a marked improvement over last year. She was fearful when she first heard of the district’s predicament in July, but Rodriguez said she is now confident the students have the focus to improve their test scores. The newfound energy at the school has also brought hope to Premont residents like Terry Carlile, who sat drinking coffee one January afternoon in the Oasis restaurant. He recalled when the town was flush with wealth from the South Texas oil boom. Back then, said Carlile, a 1959 Premont High graduate who retired after operating a service station and a tow-truck business, “we pretty much had everything we wanted.” Now he sees a town “at a standstill.” An elementary school built during that time is now abandoned, with graffiti-marked boards nailed over its broken windows. Even though Carlile does not have school-age children, he supported the recent tax increase. “To me, it’s kind of foolish if you are going to live here to not try and support and have a school even if it’s going to cost you more money,” he said. Many rural school districts face the same struggles — from dwindling enrollment to poor academic performance to financial troubles. For some state lawmakers, the districts also highlight how inequities in the way the state finances its schools appear in its accountability system. When Rep. Scott Hochberg, D-Houston, vice chairman of the House Public Education Committee, heard of Premont ISD’s plight, he requested information from the TEA on the average amount of financing each district receives and its accountability ratings. He found that districts with the lowest accountability ratings received on average $1,000 less per student than those with the highest ratings. Among those least-financed districts, Premont ISD ranks near the bottom in per-student dollars. More than 400 school districts have joined two different lawsuits against the state addressing that inequity. Premont ISD has not signed on to a lawsuit. Singleton said that his sights are focused on the tasks at hand: keeping close track of finances, getting students to their classes and improving test scores. That last objective, he said, is a testament to how important high-stakes testing has become in the accountability process. 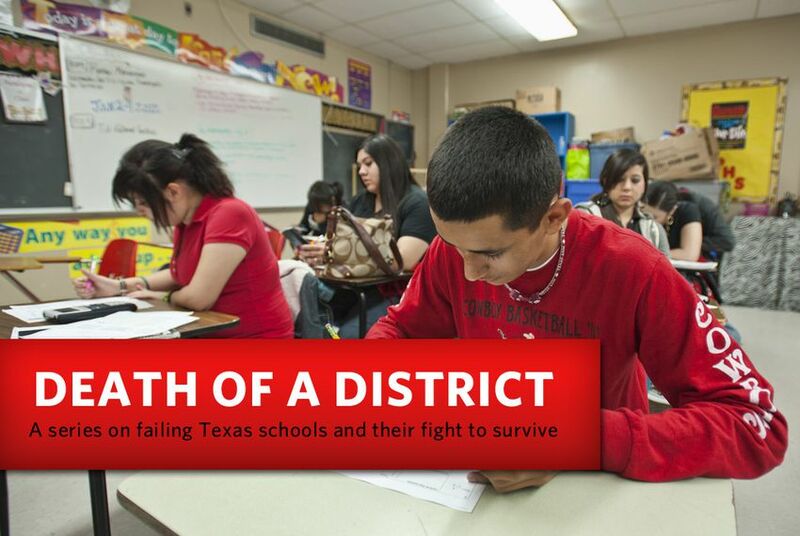 This is the third installment in a five-part series in which The Texas Tribune explores the struggles of failing school districts — and what's at stake for those who want them to survive. Part one looks at whether closing a district ends up benefiting students. Part two profiles Houston's North Forest ISD and its efforts to avoid closure. Part four looks at a rebirth for schools in the Wilmer-Hutchins area after the local district was shuttered. Part five is a video report looking at whether the state system is helping failing districts.